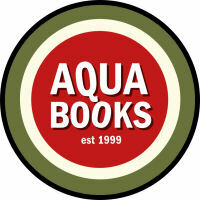 Please Note: Aqua Books is not currently buying books. This page is left here for your information, enjoyment and possible confusion. Hi, bookstore owner Kelly Hughes here. So you want to sell your books, eh? This page will tell you how we do that. (If you're too impatient to read this whole thing, at least read these first two paragraphs so you don't waste your time [and mine]. Don't get mad at me later if you haven't read things right.) 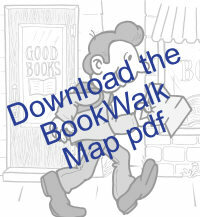 On average, 2500 books walk in our front door every week. If you bring books in, you will be asked to leave them with your name and number, and we'll get back to you within a week or so. 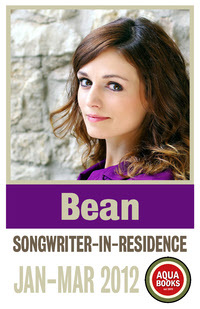 (In addition to the bookstore, we run a bustling restaurant, plus one of Winnipeg's busiest venues upstairs.) We only buy books, we don't do trade or consignment. When buying, I pay 15-20% of our selling price. Our selling price is generally 1/4 to 1/2 of the price of a new book, depending on condition and demand. We keep our selling price lower than many other bookstores, and therefore you may get more money somewhere else. I like to think I have a reputation for paying a fair price, but I also want to be really straightforward. If you're trying to get as much cash as you can, you may want to try somewhere else (see the list at the bottom of the page). If I agree to buy some of your books, I'll write down the cash amount, and you can say yes or no. Because that's the final number. I don't negotiate. (Do these seem like odd things to be saying? You understand that I'm running a business [and paying staff and overhead], but you'd be surprised at the number of people who don't get it. Having an unhappy and failed transaction with someone can ruin both their day and mine, and I try to head these things off at the pass.) If we come to an agreement on the phone or via email, you have four months to pick up your cash/cheque/books. After that, everything goes away. Okay, if you're still reading, good for you. People are in such a hurry, no? 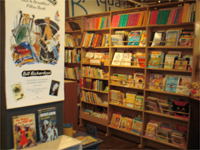 Now Aqua Books is one of the few used bookstores in the city to offer quality and selection without sacrificing affordability. From this year's titles to the enduring classics to the just plain interesting, we have some of the best books in a variety of areas, and over 85% of our 40,000 in-stock books are priced under $10. There are certain authors that we are almost always buying, but our need for other books depends on our stock and the demand for those titles. We put out almost 1000 new books a week and reject hundreds of others. Before you lug ten boxes of books across town, check out our sample list of wanted authors, which also includes details on book condition, and transportation and storage. If you're still not sure, call Kelly at 943-7555 during store hours, or email me anytime at kelly@aquabooks.ca, and I'll try to give you a better idea of our current needs. Additionally, you can go to our New Books This Week page to see some of the things that we consider very saleable. Or, if all this is way more than you ever wanted to know and you just want your old books to go away and you don't want anything for them because they might not be worth anything anyway [deep breath], just drop them off anytime. We'll use what we can use, donate what we can't use and recycle the unsaveable. For a newer book, a dealer's selling price will generally be about 50% of the original price. (Older books may vary.) For example, if you bring in a book that you bought last week for $20, a dealer might sell it for $10 and pay you $2. Selling your books may not make you rich, but it can be a great way to make some space at home. Trading is another way to go, although some bookstores, such as Aqua Books, Nerman's and Greenfield's, only buy. The stores that do trade will offer anywhere from 30-66% in credit. The Bookshelf, Red River and Bookfair (Bookfair gives 66%, although they generally only take newer books) are three of the largest used bookstores that offer trading. Many bookstores that offer trading now charge 6% GST, plus a 7% or 10% trading fee. Many of these stores also require that you trade like for like (ie. within a specific section). One thing that affects selling prices is the internet. Almost half of the used book dealers in Winnipeg also sell their books on the web. These prices can be quite high and almost all internet prices are in U.S. dollars. (If you want an idea of the price range, check out www.abebooks.com.) Burton Lysecki, Nerman's and Greenfield are three major internet players. 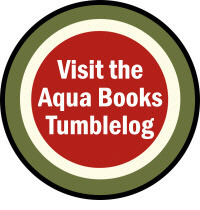 At Aqua Books, we sell our books for 1/4 to 1/2 of what you would pay for a new book, depending on condition and demand. We are proud to be one of the most affordable bookstores in the city, and as a result, our buying price tends to be a little less. If you brought us that same $20 book, we might sell it for $7, and give you $1.40.